DANCE SCHOOL S. × 尼FES. Jack in the BOX SPECIAL NUMBER開催決定!! - Dance School S.
DANCE SCHOOL S. × 尼FES. Jack in the BOX SPECIAL NUMBER開催決定!! 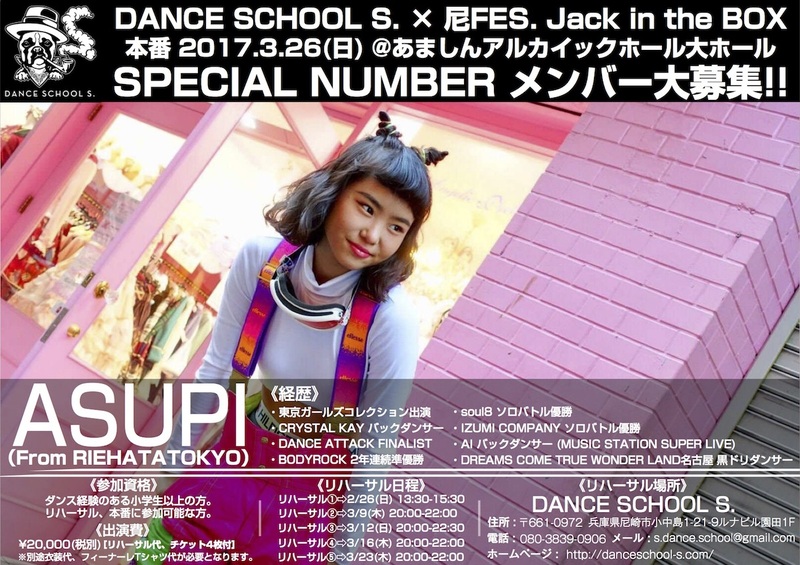 DanceSchool S. » News » DANCE SCHOOL S. × 尼FES. Jack in the BOX SPECIAL NUMBER開催決定!! Dance School S.×兵庫県最大級の野外フェス『尼FES. Jack in the BOX 』in あましんアルカイック大ホール開催決定!! 尼FES. Jack in the BOX 2015 情報解禁! !